The herb kit is continuing to do well! I am so happy! This is what it used to look like. It has really grown and I am so pleased! 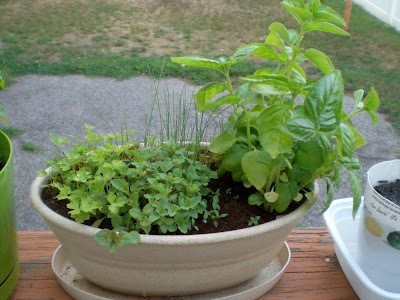 On the left is Parsley, then Oregano, behind that is chives and to the right is Genovese Basil. Nothing beats fresh herbs! Really, it just makes everything taste better. I am so in love with the Basil. So with all this great basil I have growing I decided to make a yummy treat for our friends who were coming over for dinner. Remember all the tomatoes I picked on Wednesday? I decided to make this with my bounty of ripe tomatoes. Oh my goodness, let' me just say, this is 1,000 times better with fresh garden picked organic tomatoes and freshly picked basil. The flavors were OUT OF THIS WORLD good!! Yum . YUM. YUMMO... I love fresh mozzarella cheese and basil! Great share - Happy Friday! Wow, your herb garden looks fantastic, and it's growing really well! Your caprese salad also looks super delicious. Your friends were lucky to be treated so well to garden-fresh eats! Your herb pot has really come on since those tiny plants you had before. The treats for your friends look very tasty! Looks great! 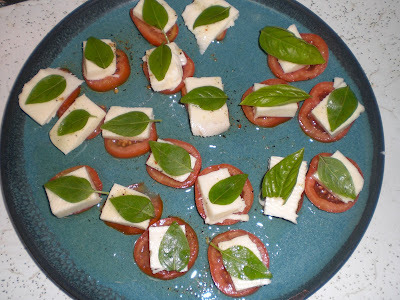 I'm going to make a caprese salad for a party tomorrow night too! You herb garden looks great . Your caprese salad looks even better. Yum! It looks very good. I bet your friends enjoyed sharing your hard work!